I want to share another great weekend night-in recipe! I make this dish ALL the time, mostly on week nights, but I think it makes a particularly de-licious meal paired with some wine on the weekend. It is a definitely a crowd-pleaser! I swear it is SUPER easy. The directions are just lengthy because, hey, if you couldn't tell, I like detail. I put my own, healthier spin on a recipe I found on the Betty Crocker website. **NOTE: I “eyeball” the amount of pasta I use, I make about ½ of whatever package I use, and I never end up putting all of it in the skillet, because it inevitably ends up being too much. I know some people have carb-o-phobia, so if you want to minimize the carbs, try up-ing the amount of chicken you use or even adding in another red or yellow pepper, or both, and cutting down on the amount of pasta you mix in. Optional: 1 jar of your favorite marinara or other pasta sauce -- whatever floats your boat! (I always put a small amount of sauce on top of my portion because, for me, it's just a little too dry without). Step #1: Cook & drain the pasta as directed. Step #2: (Can do this at the SAME time as you’re doing Step #1) In a 12-inch skillet, heat the EVOO, garlic, and sun dried tomatoes for 5 minutes on medium-high heat until garlic just begins to turn golden brown. 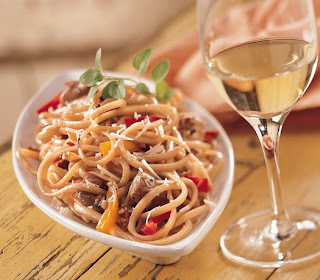 Step #3: Add oregano & basil, chicken, yellow and red peppers, and the wine. Cover and cook for about 10 minutes, stirring occasionally, until the chicken is no longer pink in the middle. Step #4: Add your pasta to the skillet along with ¼ cup of the Parmesan cheese, and toss until the pasta is evenly coated (you will have to “toss” for a while, a little arm workout for ya!). Sprinkle the remaining ¼ cup of Parmesan cheese and ¼ tsp. of red pepper flakes on top. Optional, Step #5: Pour about ½ of the jarred pasta sauce into a separate microwavable bowl. Cover the bowl (so it doesn’t splash all over your microwave!) and microwave the sauce for about 1.5 to 2 minutes, stirring half-way. You could obviously heat the sauce up on the stove while you’re cooking the other stuff as well, if you’re feeling ambitious. I usually just put this bowl out on the side and then we spoon as much sauce as we want over our own individual bowls of the pasta. Enjoy this with the red wine you already have opened, or a bottle of your favorite white. 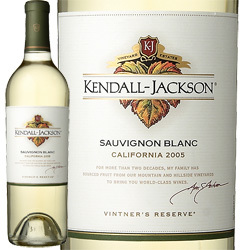 This one is PROVEN to be delicious -- it won my Wine Club's blind tasting of whites at the Christmas Party! You can really never go wrong with Kendall Jackson. Their wines always taste amazing, they are reasonable in price, and they even make a classy host/hostess gift! Going to the KJ winery is definitely on my bucket list. What's else is great about this recipe? It makes AMAZING leftovers! Put the leftovers in the fridge for the next night, or, for a real treat, take a small portion, topped with a little bit of that pasta sauce, in your tupperware to work for lunch. Proven to fill you up and get some co-workers asking "what smells so good?!" Hope you all have some fun plans to hang out with family and/or friends this weekend. Or maybe just a date with your cozy couch & a good movie! I personally recommend Conviction, with Hilary Swank, if you haven't seen it yet. Such an incredible, inspiring story, and good for both the ladies & the men! It is on OnDemand for $4.99 right now, for all you lucky people with Comcast (sense my sarcasm?). Not much of a white wine drinker, but this is a good one :) Thanks for all the tips Jess! !